All adult viviparous female Clethrobius comes are winged. Freshly moulted viviparae of Clethrobius comes (see first picture below) are light brown, but matured adult alatae (see second picture below) are dark brown or greenish black. The scleroites as far back as tergite VI bear groups of wax pore facets, producing bands of light wax pulverulence (see second picture below). The marginal sclerites on tergites I-IV are produced into blunt rounded prominences bearing 2-3 marginal hairs each. 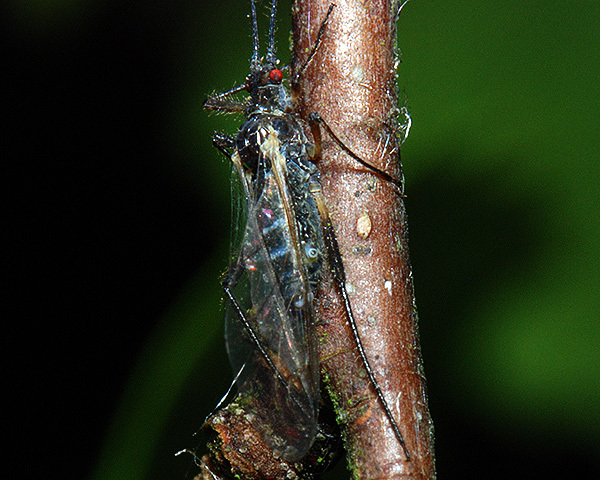 The antennae, legs and cauda are black, apart from the bases of the femurs which are pale. The antennae are much shorter than the body, with a terminal process that is 0.67-0.75 times the length of the base of the last antennal segment. The rostrum is very short, hardly or just reaching the middle coxae. The siphunculi are dark sclerotic, shortly conical, in length about 0.6 times their basal width. The cauda is knobbed and distinctly constricted. The body length of winged Clethrobius comes viviparae is 4.1-4.4 mm. The hairy birch aphid forms clusters on branches and twigs of birch (Betula spp. ), often where the new growth is dying back, or on twigs of alder (Alnus spp.) overhanging streams. 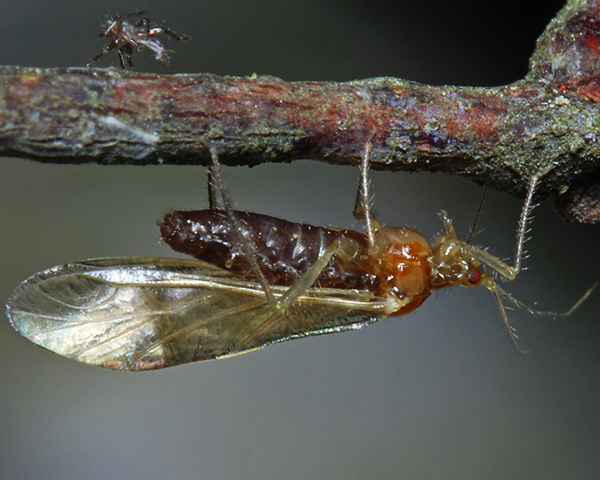 The populations on alder are regarded by some as a separate species, Clethrobius giganteus, and attempts to transfer aphids from birch to alder have not succeeded. However, no consistent morphological differences have been found. Sexual forms develop in October-November. Clethrobius comes occurs throughout Europe and across Asia to China, Korea and Japan. 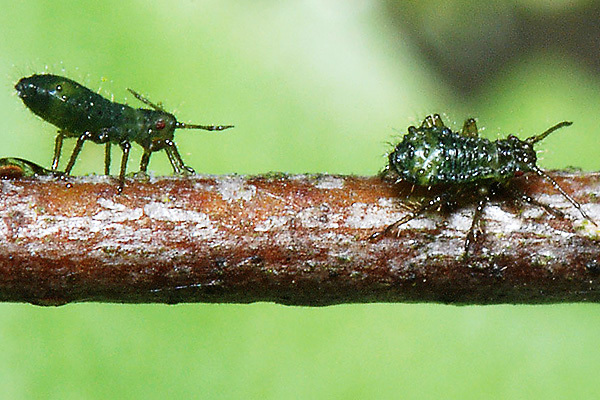 In the literature the hairy birch aphid is recorded as being rare in the UK. We have found the brown hairy birch aphid not uncommonly on birch in southern England in locations in Surrey, Hampshire, and East Sussex. We first encountered a small colony of Clethrobius comes at Warnham Common in Surrey comprising an alate with a few nymphs. The youngest nymphs (see picture below) are greenish in colour. We encountered a much bigger colony on a damaged branch of silver birch in a marshy area of the New Forest in Hampshire. 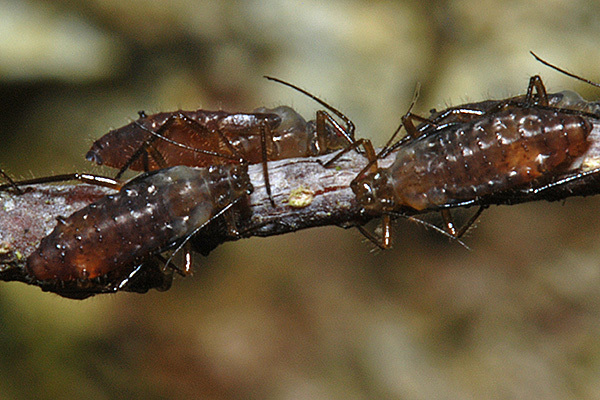 Many of the nymphs had reached the fourth instar stage, shown below. By the fourth instar, all the nymphs are brown and in this particular colony all were alatiform. 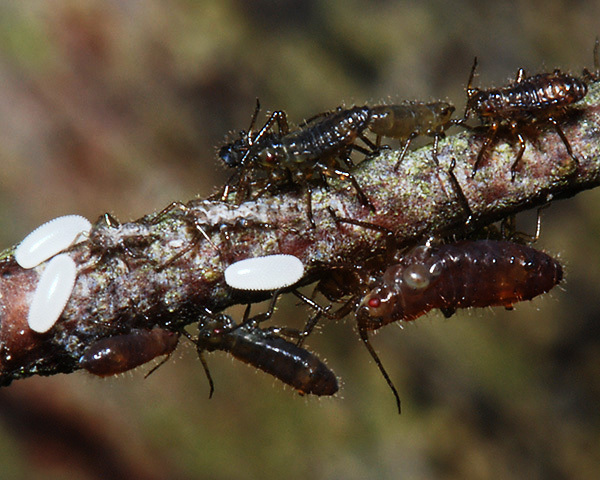 The preponderance of alatiform nymphs probably resulted from the declining nutritional quality of the branch that the aphids were feeding on. 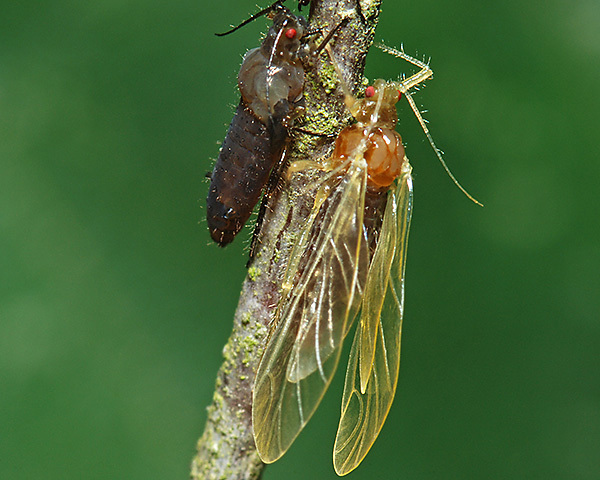 A few had moulted to the adult alate form (see picture below). Hille Ris Lambers (1947) records that colonies of this species may reach enormous numbers. Large aphid colonies usually attract aphid predators, and this one was no exception. The picture below shows several syrphid eggs laid amongst the colony. Michalik (2010) describes endosymbionts (Buchnera aphidicola) found in Clethrobius comes. These endosymbionts provide their hosts with essential amino acids which are absent in phloem sap of plants. Endosymbionts are transovarially transmitted from mother to offspring. In the oviparous generations bacteria were found to infect choriogenic oocytes, whereas in the oviparous generations they were found to infest young embryos. Of the 17 species on Betula pendula, Baker (2015) lists 14 as occurring in Britain: Betulaphis brevipilosa, Betulaphis quadrituberculata, Calaphis betulicola, Calaphis flava, Callipterinella calliptera, Callipterinella minutissima, Callipterinella tuberculata, Clethrobius comes, Euceraphis betulae, Glyphina betulae, Hamamelistes betulinus, Monaphis antennata, Stomaphis quercus and Symydobius oblongus. Blackman & Eastop list 8 species of aphids as feeding on common alder (Alnus glutinosa) worldwide, and provides formal identification keys for aphids on Alnus. Of those, Baker (2015) lists 7 aphid species as occurring in Britain: Clethrobius comes, Crypturaphis grassi, Glyphina betulae, Pterocallis alni, Pterocallis maculata, Stomaphis quercus and Stomaphis wojciechowskii. We especially thank Warnham Common Nature Reserve for their kind assistance, and permission to sample.